A simple trick to make sure that you aren’t angling your legs forward is to look at your ankles. This makes you shift the pelvis back. Gently press your feet into the ground and you subtly extend the crown of your head upwards. You don’t want to cause tension in the body by over-stretching the spine, just set the intention to gently elongate in both directions. Remember, relaxation is the name of the game. Lengthen the crown of the head toward the sky while releasing the muscles of the neck. 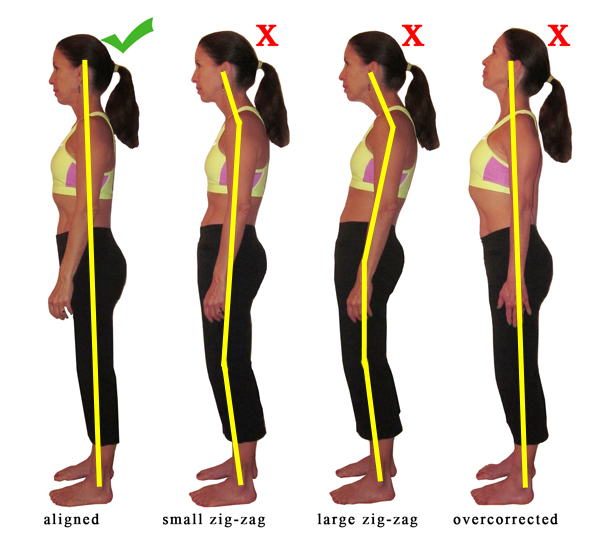 With the neck long and relaxed, the chin is free to angle slightly downwards. 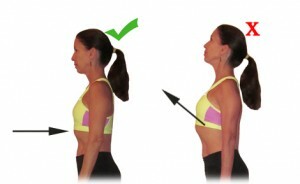 Instead of pinching the shoulder blades, do a few shoulder rolls backwards one side at a time. Take a few deep breaths and imagine your shoulders getting farther apart with each exhale. Try to make your upper back wider. But remember that open shoulders do not mean flaring the lower ribs. Since the goal of good posture is relaxation, you want to find a comfortable and restful position for the chest. Allow the lower ribs to come down into the body so that the rib cage is not angling backwards. You will immediately feel a straightening of the lower back.